Out of the gate, New Brunswick has positioned itself as a leader in the cannabis industry. With the legalization of recreational cannabis on the horizon in Canada, New Brunswick has identified cannabis as a major economic development driver and is putting the pieces in place to capitalize on this new opportunity. Genomics can help. A powerful biotechnology that combines genetics, biology and computer science, genomics is helping cultivators and breeders to identify desired traits, accelerate breeding, and unlock opportunities for the development of specialized strains and medicinal products. 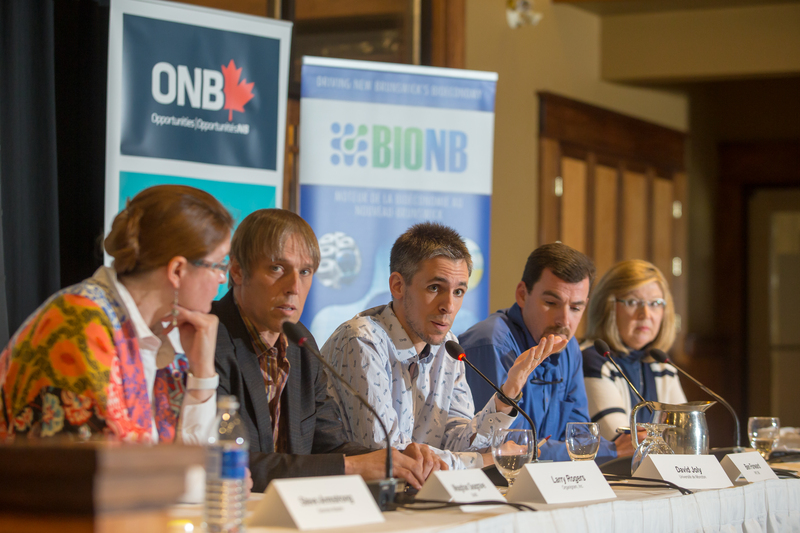 Against this backdrop, Genome Atlantic, in partnership with ONB and BioNB, hosted a panel discussion in Fredericton in early May focusing on the broad spectrum of opportunities along the cannabis value chain, including the role of genomics. “From Crop Science to Health Research – Maximizing Opportunities for Cannabis in New Brunswick” included panelists representing major players in New Brunswick’s emerging cannabis industry. The event focused on maximizing cannabis opportunities along the entire value chain, and drew more than 70 cultivators, breeders, genetic researchers, testers and analysts, as well as senior government representatives, including Andrew Harvey, New Brunswick’s Minister of Agriculture, Mines and Rural Affairs, and several representatives from the Atlantic Canada Opportunities Agency. The panel opened with Meaghan Seagrave, Executive Director of BioNB, who provided an overview of New Brunswick’s strengths and opportunities in relation to this emerging industry. 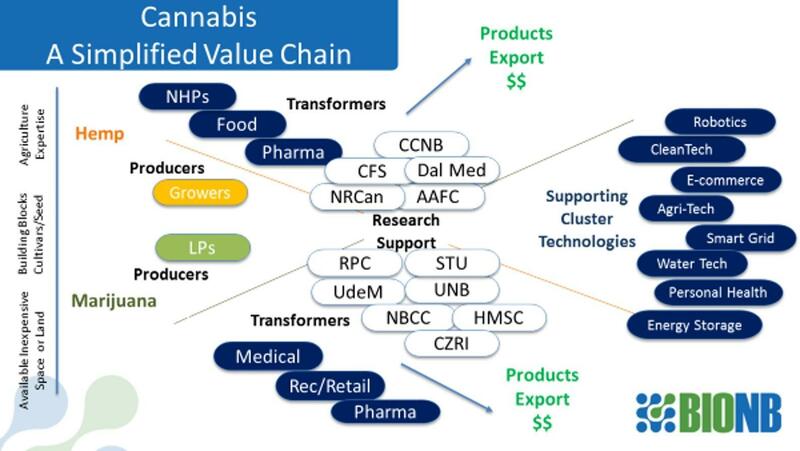 Seagrave has written and spoken frequently about the opportunities for New Brunswick along the cannabis value chain. “We have the most affordable agricultural land in North America or Europe. We’ve got solid building blocks around genomics, cultivars and seeds, all the starting components for cannabis. And we have significant agricultural expertise, about 150 years’ worth,” Seagrave noted. Seagrave suggested that cannabis presents many opportunities for New Brunswick – for example, to utilize agricultural land, build research capacity, technology companies and supply chains, attract investment in new technologies, and generate new IP and exports. “But the real opportunity is in understanding the entire cannabis value chain and maximizing growth all along the way,” she said. Organigram Inc. is a leading licensed producer of medical marijuana based in Moncton. Organigram’s VP of International Business Development Larry Rogers described the company’s plans for growth as it expands its existing medical cannabis production and prepares for the adult recreational cannabis market. In March, the company opened a 100,000 square foot expansion to its Moncton production facility and plans to expand to nearly 500,000 square feet by April 2020. Panelist Dr. David Joly, Assistant Professor in the Department of Biology at Université de Moncton, started working on cannabis in 2015 through a collaboration with Organigram Inc. The project resulted in the identification of three candidate genes in cannabis that could protect against powdery mildew, a major disease affecting cannabis. Since then, Joly and his colleagues Drs. Martin Filion and Étienne Hébert-Chatelain at the university’s Cannabis Innovation and Research Centre have conducted research on many aspects of the cannabis plant, including growth rate and yields, often involving ongoing collaborations with Organigram and other private companies. “Basically, we are using genomic technologies to help reduce disease and boost productivity, so there is quite a spectrum of research activity in which we are engaged,” said Joly. He highlighted two current projects, one with Organigram and one with Canutra Naturals, aimed at addressing some of the industry’s most pressing issues. “Our latest project with Organigram includes looking at ways to improve cannabis productivity through microbial inoculants and developing the genomic tools to help develop strains with improved traits. With Canutra Naturals, we’re focusing on some of the same issues but with hemp,” Joly explained. The Research and Productivity Council of New Brunswick (RPC) is one of the largest organizations in Canada engaged in the medical marijuana testing business and provides analytical services to about half of all licensed producers in Canada. RPC has been working with the hemp industry since the late 1990s and started testing medicinal cannabis in 2014. Panelist Dr. Ben Forward, RPC’s Head of Food, Fisheries & Aquaculture Department, outlined the rapidly-expanding opportunities that cannabis is presenting for his organization including in relation to the recently-announced agreement RPC signed with Colorado-based Sunrise Genetics to begin genetic testing in Canada. “DNA testing and analysis leads to some very important outcomes, including the ability to concretely identify cultivars to assist patients using medical cannabis to reliably access the strain that effectively treats their condition. DNA-based traceability will provide for improved product safety and the ability to authenticate shipments and batches of material to verify product origin and maintain supply integrity. Beyond that, many other R&D opportunities will arise as the industry grows,” said Forward. The New Brunswick Health Research Foundation (NBHRF) was instrumental in last year’s announcement of two cannabis research chairs in New Brunswick. The chair at St. Thomas University will focus on research policy development, socio-economic and health-related issues of cannabis use, while the University of New Brunswick chair will address the pharmacology and biochemistry of cannabis and will conduct pre-clinical studies. Genome Atlantic’s Steve Armstrong, who emceed the panel discussion, wrapped up the session by thanking the speakers as well as ONB and BioNB for their collaboration in organizing and hosting the event. “We see tremendous potential for genomic technologies to add value to the cannabis space. That was the catalyst to initiate this session today in partnership with those leading the charge here in New Brunswick,” said Armstrong.